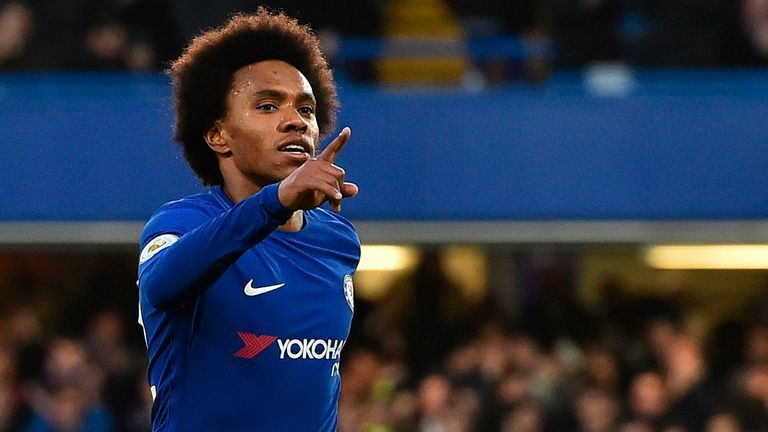 Paris Saint-Germain are planning to make a late Deadline Day bid for Chelsea winger Willian, according to Sky sources. The Ligue 1 champions are chasing a replacement for Neymar, after it was confirmed on Wednesday that the forward would be out for three months with a metatarsal injury and will miss both legs of their Champions League last-16 meeting with Manchester United. Following reported interest from PSG for Chelsea's Willian, we take a look at some of his best Premier League moments from last season. Willian, who was a second-half substitute during Chelsea's 4-0 defeat at Bournemouth on Wednesday, has also been of interest to Barcelona this month, as well as being linked with a move to China. The 30-year-old has 18 months left remaining on his current contract, but the club remain adamant he is not for sale as they battle for a top-four finish in the Premier League. Which Deadline Day moves will happen? Chelsea are also determined to keep hold of young winger Callum Hudson-Odoi and have turned down a transfer request from the 18-year-old, amid rejected bids from Bayern Munich. The club will welcome Christian Pulisic from Borussia Dortmund in the summer, but it is also expected that Real Madrid will renew their interest in Eden Hazard at the end of the season, which could leave them short in wide areas.